Our new recommended wireless router for 2017 is the Synology RT2600ac, which is a state-of-the-art wireless router that provides the capabilities we believe are necessary to get the very most from a broadband connection. The RT2600ac combines outstanding wireless coverage and speeds, effective traffic control capabilities and a simple user interface. The RT2600ac is future proof with the very latest MU-MIMO capability to provide even faster WiFi speeds in households with multiple wireless devices. The Synology RT2600ac provides a perfect match with a state-of-the-art broadband modem, such as the Billion 8800NL R2, to squeeze the very best real-world performance from either a conventional broadband (ADSL) or fibre broadband (VDSL2) connection. If you buy this product using the link below, we earn a small commission to keep this site going. Thank you! 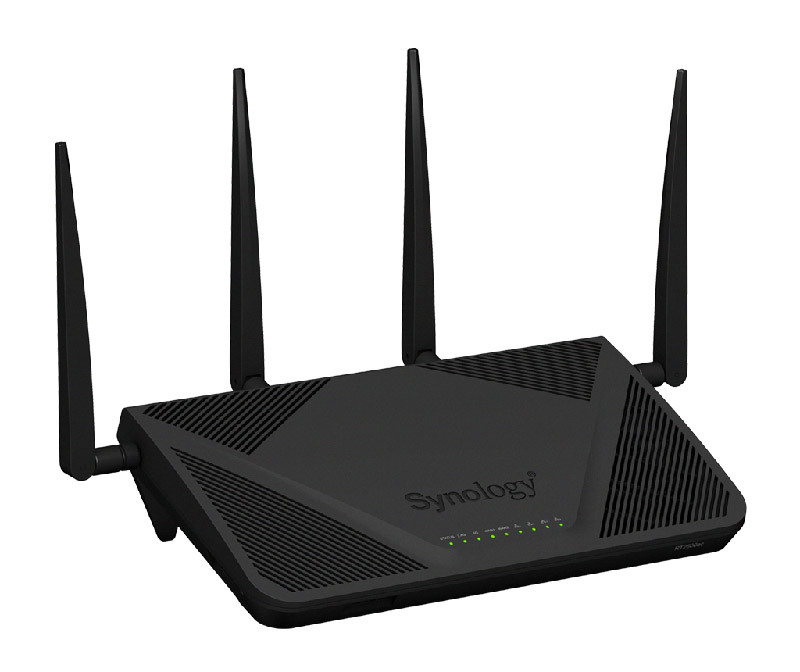 The RT2600ac is a new wireless router from Synology. It is, in fact, only the second router produced by the company, with the previous lower-specification RT1900ac model being launched in 2015.
ease of use, so that it can be configured easily by non-experts. Physics play an important part in defining how a wireless router performs in terms of range and speeds and the RT2600ac rates highly in this regard. While a small unit with hidden internal antennas may look neater, there is no alternative to employing large external antennas spaced a considerable distance apart to overcome the effects of signal fading at different locations. The RT2600ac looks quite imposing, with four widely-spaced external antennas, but we certainly prefer this design approach to some compromised alternative. The WiFi performance of the RT2600ac has already been extensively tested by another of different people so we are not going to reproduce results here. Tests have shown that the RT2600ac provides outstanding wireless performance and range, particularly using the 2.4GHz band. The RT2600ac has received glowing reviews for its overall performance. For example, SmallNetBuilder has ranked the Synology RT2600ac as number one in its ‘Router Ranker’, particularly noting outstanding WiFi performance at 2.4 GHz. 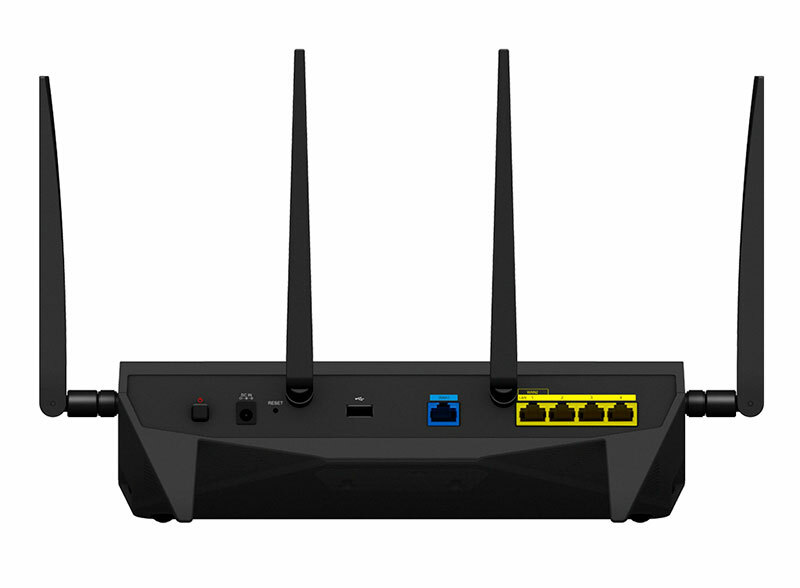 According to CNET, the RT2600ac is one of the fastest WiFi routers with the most comprehensive set of features. 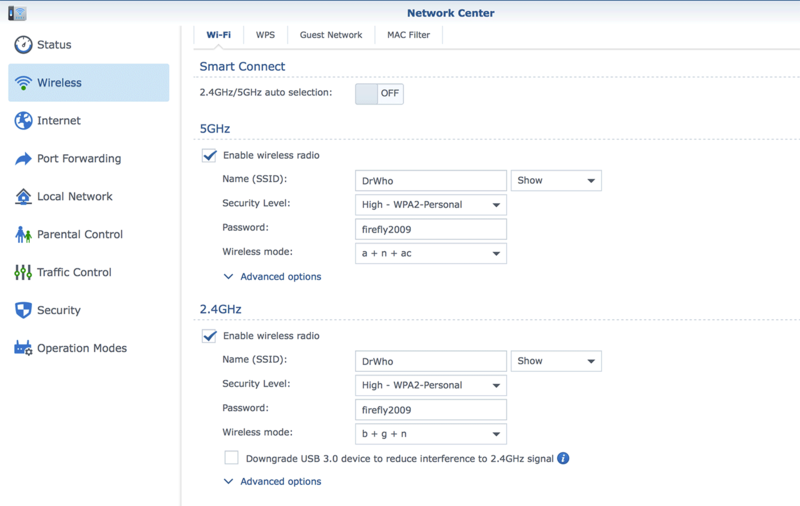 WiFi on the Synology RT2600ac is very easy to set up. More advanced options are initially hidden from the user, which is a nice touch, to make set-up very straightforward. Since WiFi range for the 2.4GHz band is generally greater than with 5GHz, the RT2600ac works very well in challenging locations, for example, serving a room at a considerable distance from the router. The RT2600ac is future proofed as it supports the very latest Multiple-User MIMO (Multiple Input Multiple Output) capability as part of the latest 802.11ac Wave 2 standard to provide wireless speeds up to 800 Mbps and 1733 Mbps on the 2.4 GHz and 5 GHz bands, respectively. Currently, most other wireless routers incorporate so-called Single-User MIMO. The big disadvantage of Single-User MIMO is that, when multiple devices are connected to a router at the same time, transmission of data can only occur to one device at a time. When multiple wireless devices (e.g. mobile phones and laptops) are connected to a Single-User MIMO router, they have to take it in turns communicating to the router. This becomes increasingly inefficient as the number of wireless devices increases, slowing down overall speeds. Single-User MIMO does not provide optimal performance since many households now contain a multitude of devices. Furthermore, the performance of Single-User MIMO is limited by the capabilities of the weakest device (for example, in terms of how many antennas they have). With Multiple-User MIMO, the router is able to send and receive data to multiple devices simultaneously, enabling higher overall speeds to be achieved. Furthermore, with multiple streams, overall performance is not limited by a particular device with weaker capabilities, as is the case with Single-User MIMO. Given that the number of separate WiFi-enabled devices in a typical household is likely to increase, Multiple-User MIMO will become more and more useful to maximise WiFi speeds. 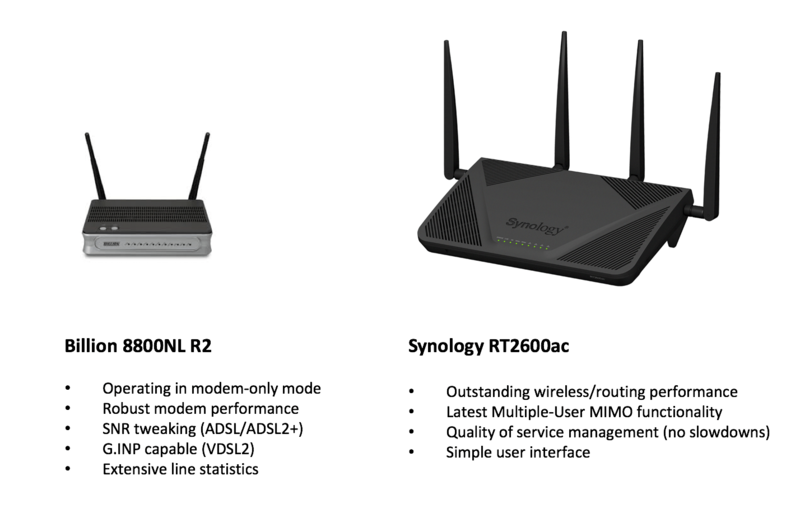 The RT2600ac gives its absolute best performance when all devices support MU-MIMO. The number of compatible devices is increasing rapidly and it is expected that Apple will incorporate MU-MIMO capability in its next iPhone version. Even if only one device in a household is compatible with MU-MIMO, all other devices will benefit. A broadband connection can often represent a major bottleneck when multiple devices are connected, particularly for broadband connections suffering from limited speeds. Even a pretty decent broadband connection can struggle to support multiple users at the same time. It is not hard to imagine situations when a broadband connection cannot support traffic demands. For example, imagine a movie being downloaded or streamed in one room when someone in another room is watching YouTube while another member of the family struggles to browse the Internet, desperately trying to work from home. I’m sure many of you have experienced such situations and the adverse impact that extensive use of intensive services such as YouTube can have on a broadband connection! Even the best WiFi performance will not help when the bandwidth requirements of separate devices exceed the capacity of a broadband connection. This is where traffic management comes in. This is the capability of being able to prioritise (and deprioritise) certain devices and applications. The Synology RT2600ac contains excellent features to do this. Importantly, it achieves effective traffic management without slowing down overall speeds. Optimum traffic management requires relatively sophisticated processing since the router needs to understand and manage the traffic going to each device. While many router manufacturers claim that their products incorporate some type of traffic management, this often does not work properly and/or dramatically slows down overall speeds. The Synology RT2600ac is a powerful device with a 1.7GHz dual core CPU and 512MB of DDR3 memory. It incorporates Layer 4 and Layer 7 hardware acceleration. The practical significance of this is that the Synology RT2600ac can restrict the bandwidth consumed by individual applications and devices without any significant slowdown in overall performance. Traffic control can be achieved in several ways. For traffic management to work effectively, the total system maximum download and data rates should be entered so that the traffic management system knows the maximum speeds of the broadband connection. 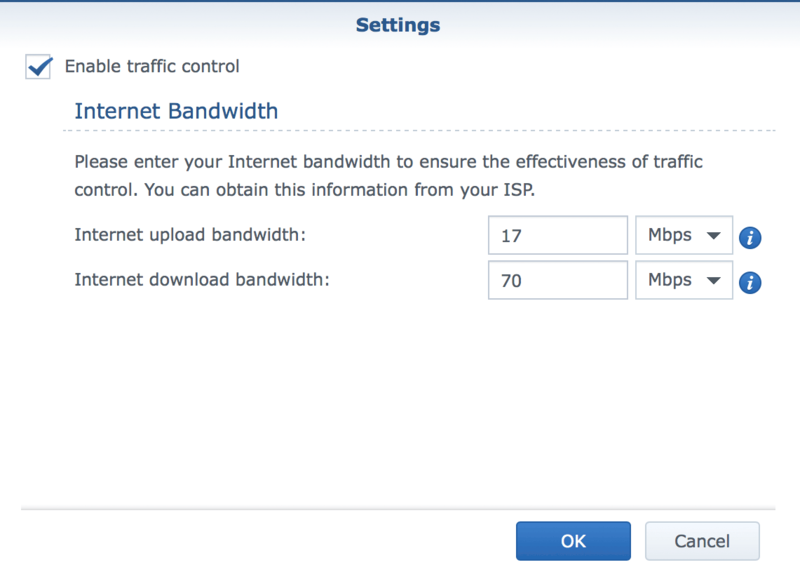 As demonstrated by the screenshot on the left, this is done by ticking the 'Enable traffic control' option in Settings, and entering the maximum upload and download speeds for the broadband connection. the maximum download speed desired. Obviously, it is important to ensure that the total guaranteed minimum upload and download speeds do not exceed the total maximum system speeds entered. In fact, the system warns you if this is the case. With this traffic management system, it is possible to guarantee minimum speeds for certain devices. For example, if a PC (dedicated for home working) is used for Skype, minimum speeds can be set to ensure these speeds are achieved even when the broadband connection is fully utilised. This ensures that Skype continues reliably even when the connection is under severe pressure. With this setting, it is also possible to constrain the speeds of potential bandwidth ‘hogs’ on your system, which (left unchecked) may consume an unduly large proportion of the available bandwidth. For example, it is possible to constrain the maximum download speed for media and set-top boxes (including a Sky box). The Synology RT2600ac also allows you to prioritise and deprioritise certain devices by allowing the user to define up to three ‘High Priority’ devices and up to three ‘Low Priority’ devices. 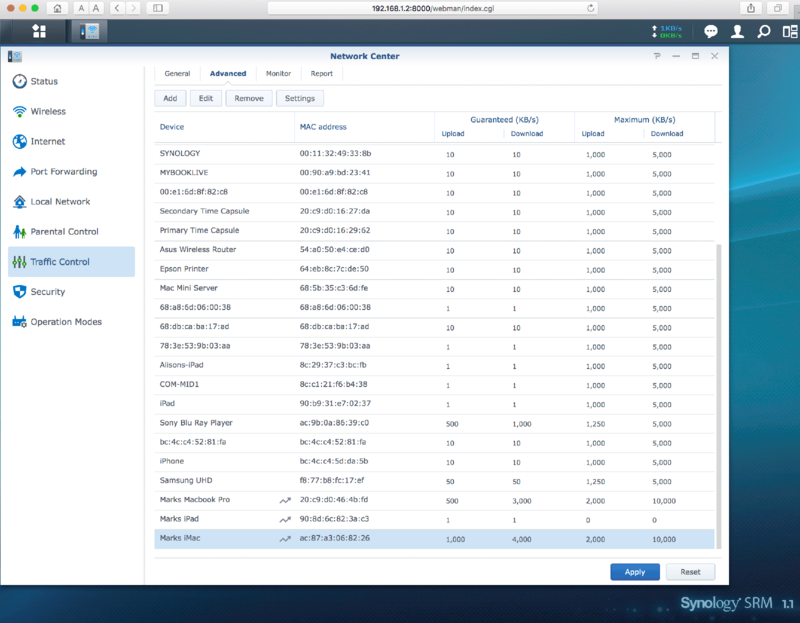 According to Synology, devices set to ‘High Priority’ have prioritised network bandwidth allocation. In contrast, devices set to ‘Low Priority’ will be allocated network bandwidth after High Priority and priority-unmodified devices’ requirements have been satisfied. Certain applications (such as YouTube) can potentially cause a limited broadband connection to grind to a halt. This is because YouTube may attempt to download a video being viewed as quickly as possible in as higher quality as possible. 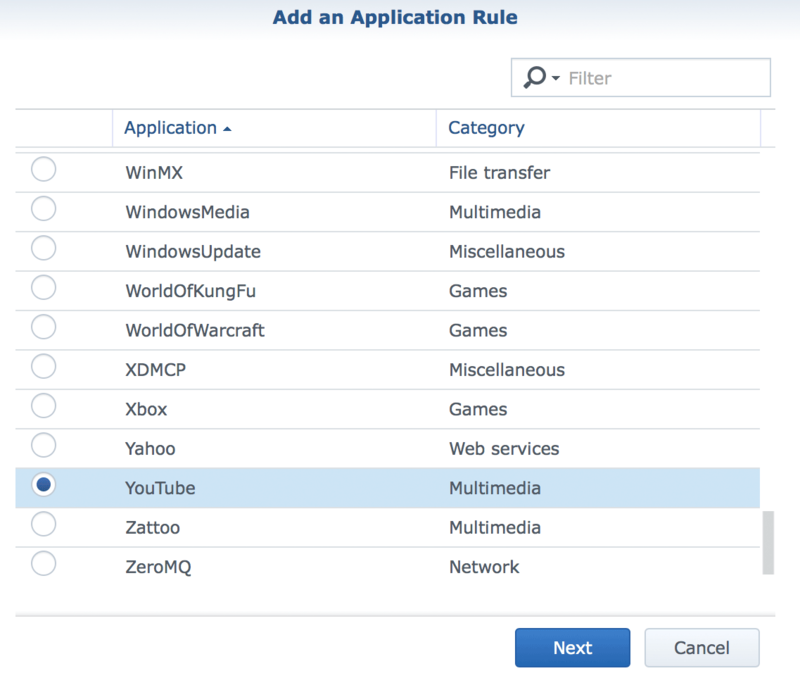 With the Synology RT2600ac, it is possible to constrain the bandwidth usage of specific applications, such as YouTube, by setting maximum upload and download speeds. This is done by adding an application rule (as shown on the left). No longer will a broadband connection be held ransom by a teenager watching YouTube in their bedroom! Overall, we found that the traffic management of the Synology RT2600ac worked very well, and we could not detect any reduced performance due to the operation of the traffic management. A major issue with many routers is that configuration can be fiendishly difficult, with lots of complex, impenetrable menus. 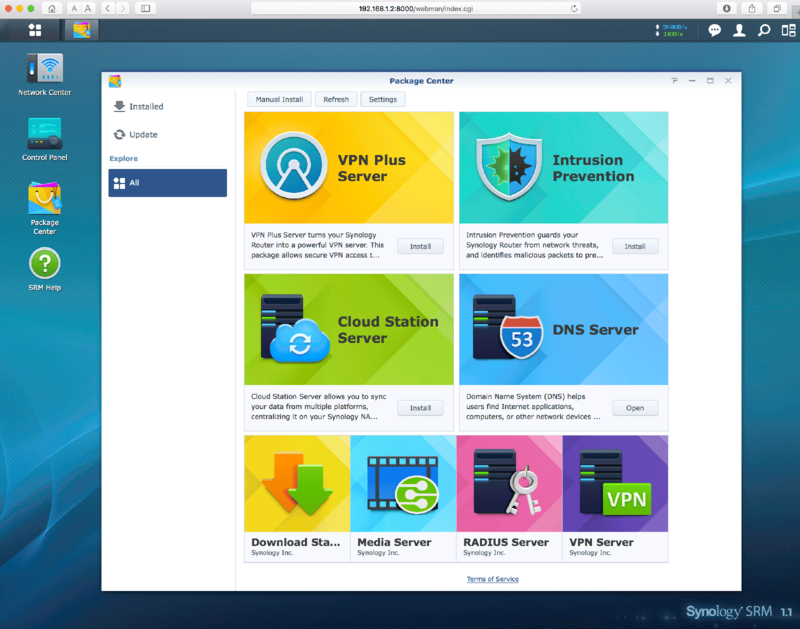 In sharp contrast with these, Synology’s user interface is similar to that of its NAS drives. It is very clear and easy to navigate. In use, it feels more like the user interface of a mobile phone or tablet than the slow menus of a typical router. VPN Plus Server, which turns the router into a VPN server, allowing secure VPN access through a web browser or client. It supports WebVPN, SSL VPN, OpenVPN, L2TP/IPSec and PPTP. Intrusion Prevention, which guards against network threats and identifies malicious packets to prevent infection and data compromise. Media Server, which provides multimedia service allowing multimedia content to be browsed and played via DLNA/UPnP devices. Router firmware can often be riddled with bugs that do not get resolved for many months. It is good to see that Synology is supporting its router with regular firmware updates. The router checks for the latest version of its firmware (which it calls SRM). These updates are very frequent, which is a good sign. In the few weeks of testing, there were three separate updates. ISPs generally now provide their own all-on-one wireless modem router as part of their broadband packages, which incorporates a modem, router and WiFi wireless capabilities all in one box. While this approach is cost effective for an ISP, it means that broadband users are stuck with any performance or capability limitations in any of these areas. The Synology RT2600ac is a wireless router only and does not incorporate its own modem, which is a significant benefit from our perspective. It means that it can be partnered with a separate state-of-the-art modem, such as the Billion 8800 NL R2 (our favourite modem for both conventional ADSL and VDSL2 fibre broadband connections). For conventional ADSL broadband, the Billion 8800NL incorporates SNR margin tweaking, which is a feature that is very rare and not included in any ISP-provided devices. This allows ADSL broadband users to extract greater speeds, particularly on challenging lines. The Billion 8800NL is equally well suited for fibre broadband connections too, being fully compatible with the latest G.INP technology used by BT. For the purposes of our review, we connected the Billion 8800NL to the WAN input of the Synology RT2600ac using an Ethernet cable. The Billion 8800NL was set into so-called ‘bridge mode’, which reduces the functionality of the Billion 8800NL (which also incorporates router and limited wireless capability) to a that of a basic modem. After weeks of testing, we have found that the Synology RT2600ac works brilliantly with the Billion 8800NL R2, to provide a superb combination of best-in-class capabilities. While the Synology RT2600ac is priced as a premium product, it certainly has the performance and usability that justifies its price. When partnered with a state-of-the-art modem, such as the Billion 8800NL R2, performance is outstanding and will extract the greatest speeds that your broadband connection is capable of. For those suffering with relatively low broadband connection speeds, the bandwidth management features are particularly worthwhile. With a combination of traffic management and SNR tweaking (with a separate modem), conventional ADSL broadband users suffering from poor broadband speeds will notice a dramatic uplift in real-world speeds. Equally, those high-speed fibre broadband connections will be able to get the most of these speeds with excellent WiFi range and speeds. With MU-MIMO functionality, this is a superb, future-proofed router. 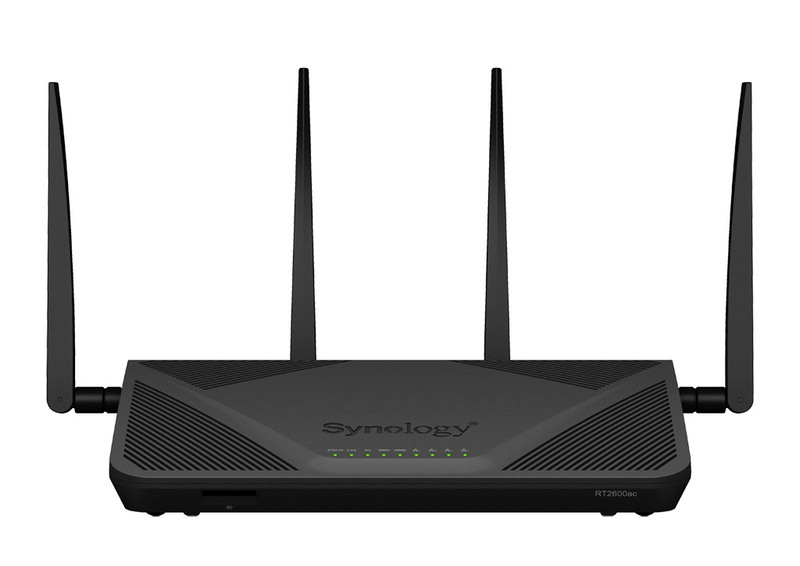 The Synology RT2600ac is our new recommended wireless router for both conventional ADSL and fibre broadband users. If you purchase the RT2600ac using the link below, the small commission helps keep this site running. Thank you!